This past summer, David and I made a lot of salsa. This was due in part to a breakfast experiment for David, which included him modifying his morning meals to include a spinach and orange juice smoothie, avocado and can of sardines (yes, really), but that’s a topic for another post. Anyway, the cilantro. Cilantro is one of those things that you don’t realize how important it is in your recipe-and how grocery stores have an uncanny knack for being out of it when you need it- until you attempt to make salsa on a weekly basis. And the amount it's sold in? Ridiculous. Most of the time it’s only sold either in a little box or a gigantic bunch, the latter of which you’ll probably just use a third of, then forget about in your crisper until weeks later. So it was with crossed fingers that I made my grocery list for David’s latest welcome back-from-Michigan-dinner. The menu, after careful deliberation, included Nem Nướng, adapted from the Angry Asian's recipe here, Vietnamese Coffee Jello Shots from the Food Librarian, and Pork Belly Banh Mi with Spicy Cucumbers from the Kitchy Kitchen. And guess what a major ingredient in a banh mi is? Luck was with me however, because when I arrived at the store, glorious bunches of cilantro awaited me, sitting pretty next to the Italian parsley. I made the jello and the dipping sauce for the pork meatballs the night before, and marinated the pork belly in the beer and spices overnight. I consulted one of my favorite cookbooks for advice on how to serve the Jello shots. What, you don't have a fancy Jello shot cook book? Just me? I also made David a menu in the style of a treasure map, wetting card stock, folding and crumpling it, then staining it with instant coffee and using sharpie and oil pastels once it was dry to add some color. I also attempted to make almost no-knead French baguettes. I followed the recipe. I even measured out my flour, which, if you know me, is a big step. This is what I got. Comically flat and unusably dense, I opened the door of the oven, saw these paddle shaped loaves and began giggling hysterically. Fully anticipating this would happen, I had wisely purchased some back up loaves with the rest of the groceries, and so dinner was saved. Other than the bread fail, dinner was fantastic. 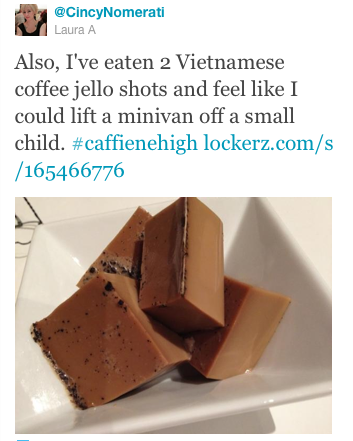 The Vietnamese Jello-shots were rich and strongly caffeinated. I altered the pork meatballs slightly by adding paté to the mixture of the pork, and we also took the bahn mi to 11 and added paté to that as well. The pork meatballs and dipping sauce were delicious, and the banh mi was even better than I could have anticipated. It is without a doubt, one of the favorite sandwiches ever made in our kitchen, and probably the best banh mi we've had anywhere. The spicy pickles were very good, though they required the Mandoline to prepare. That’s right, the kitchen implement dubbed in some professional kitchens as “The Tool of Death”. * By being careful and paying attention (and also using the guard that looks like a cowboy hat, always recommended) I escaped unscathed. Everything looks amazing as always, Ms 5chw4r7z would agree with you 100% on finding cilantro. We bought our first mandolin over the summer, I don't know how we cooked without it now that we have one. "Veitnomnom" is so wrong. SO. Wrong. But I love it. I have to admit, I was sceptical about the jello shots and fully thought that as I read through this post, I was going to end up doing the usual "Oh, wow, isn't pork belly awesome," kind of thing. That said, I want to make those jello shots. Also, the no-knead looked great. I like the deep craggly cust. Thanks for the tip and recipe for coffee jello shots. I'm definitely giving those a try. If David is looking for other low carb breakfasts, he should try chicken sausages from Trader Joes. They are low in calories and come in different varieties.